The earliest playgrounds, called “sand gardens,” appeared in the 1880s on the grounds of settlement houses. Furnished with innovative play equipment like seesaws, and staffed by trained recreation specialists, the playground was designed to be a “healthful influence upon morals and conduct.” As Teddy Roosevelt, President of the Playground Association of America, wrote: “If we would have our citizens contented and law-abiding, we must not sow the seeds of discontent in childhood by denying children their birthright of play.” For these reformers, recreation was not an end in itself: it was directly linked to the preservation of social morality. Groups such as the New York Society for Parks and Playgrounds formed to raise awareness of the importance of play for children’s health. The Society organized parades of mothers and babies, planned public meetings to demonstrate the use of the see-saw, and opened its own playground on Second Avenue and 91st Street. In 1903, the first municipally run playground in the United States, Seward Park, opened on the Lower East Side. In the Depression Era of the 1930s, federal aid through the Works Progress Administration enabled the City to greatly expand and improve its play spaces. Under the stewardship of Parks Commissioner Robert Moses, new playgrounds were constructed at an astonishing rate throughout the decade. Moses was able to harness the massive manpower of the Parks Department, whose ranks had swollen to more than 80,000 workers due primarily to the influx of federal money. When Moses assumed the commissionership in 1934, there were only 119 playgrounds in New York City. By 1960, the end of the Moses reign at the Parks Department, there were 777. Typically, these playgrounds were characterized by large areas of asphalt adorned with sandboxes, seesaws, metallic jungle gyms and monkey bars, swing sets and slides. They were designed for the use of a wide age group, from small children to those of early adolescence. Moses’ playground construction program greatly benefited many overcrowded city neighborhoods. 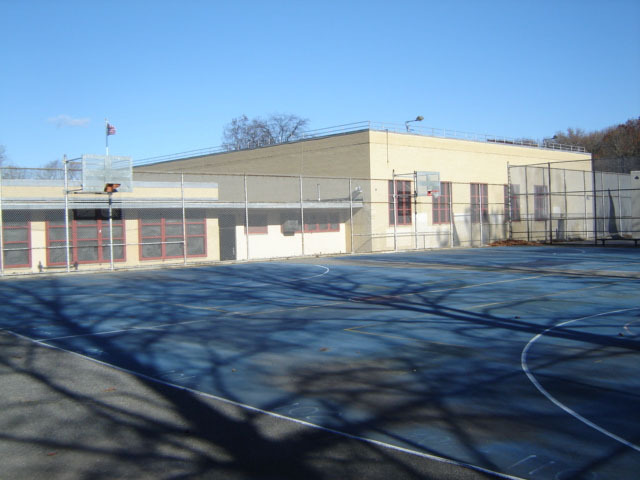 Alley Playground, located near the much larger Alley Pond Park, takes its name from Alley Creek, a body of water that flows from Little Neck Bay into a pond located near the point that the Long Island Expressway and Cross Island Parkway presently meet. 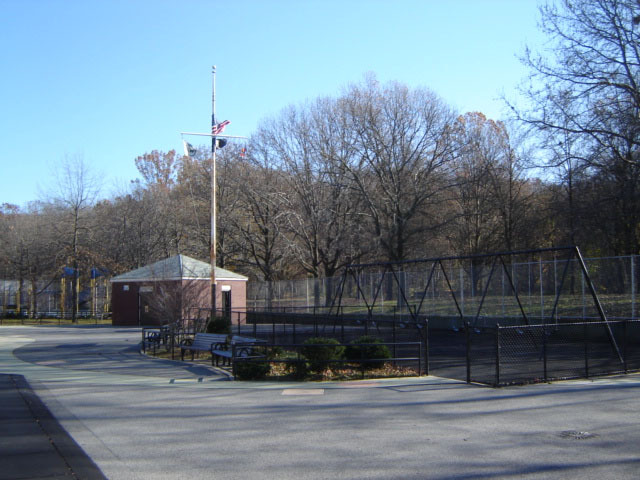 The City acquired the land for Alley Pond Park on November 20, 1952 and Parks and the Board of Education have jointly operated the playground since its opening on September 14, 1956. Commissioner Stern gave the site its current name in 1985. This playground, situated adjacent to P.S. 213, the Carl Ullman School, contains iron fences with decorative cats, birds and vines, swings, benches, handball and basketball courts, two sets of play equipment with safety surfacing, which feature a duck, toucan, frog and bumble bee on springs. The park’s animal theme is continued in its spray showers and inlaid cement designed in the shape of a cat and a fish. In 1997 Mayor Giuliani funded a $82,500 project that repaired fences and sidewalks, and performed other site work and, in 2000, he financed a $62,000 reconstruction of the park’s comfort station. 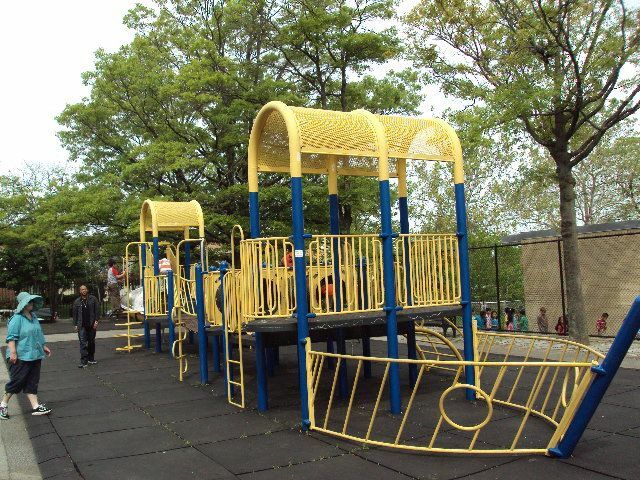 In the same year, Council Member Sheldon S. Leffler allocated $680,000 for the reconstruction of Alley Playground, changing the park into its current form.